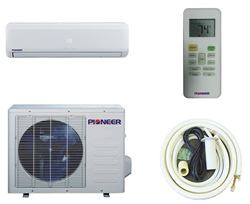 One type of air conditioner that is growing in popularity is the ductless mini split system for its versatility, economy and asthetic design that looks good in just about any setting. Opting for this kind of AC gives you scalability depending on your budget. This is where you can start out by cooling just one room in your home. Then over time increase the number of rooms serviced by nice looking AC units that have many advantages, as this article will cover. What is a Mini Split Ductless AC? This is the kind of aircon you see in homes that don't have a central system. There is a unit in each room usually sited high up on a wall and operated by a remote to set temperature and fan speed, oscillation and the timer function to automatically turn it on or off when you choose. In my opinion, the advantages far outweigh the disadvantages for this type of indoor cooling solution. If you were to have a central HVAC system installed, of course that would be a major undertaking and extremely costly when compared with opting for a room by room AC and heating solution. The ability to scale starting with as little as just one roomand then adding more individual uinits as your budget allows over time is a major plus point. It means you can have a cool (or warm) space indoors for a fraction of the cost of a central HVAC and expand to more rooms as you can afford to do so. There are many very good, modern systems currently on the market but we have our own preferences in makes and models that get the job done efficiently, economically and also (very important) quietly. Some AC brands are quieter running than others and we find many customers prefer the quieter ones. That's because they allow them to watch TV or listen to the radio without having to increase the volume unnecessarily to get over the AC hum. Aside from the background noise of varying levels, there are also differences in energy consumption from one model to the next. Obviously you will want to install the most economical model to avoid getting huge utility bills through the summer! Below are two of our favorite models that can be purchased online at very affordable prices and they can be installed by our own engineers or you can engage a qualified installer of your choice if you prefer. The indoor unit contains the compressor and refrigerant system that intakes room temperature air and processes it, dramatically lowering its temperature, then expels the now cold air back into the room. The heat given off by the cooling process along with excess moisture in the air is sucked from the indoor unit through a vent hole in the external wall behind it by the external unit which is simply a powerful fan that extracts the hot, moist air and blows it out into the open atmosphere. Why is it Called a Ductless AC? This type of interior cooling system differs from the larger, whole house system in that it doesn't need any ducting to transport the cold air to different parts of the building or the hot exhaust air outside of it as a whole house system does. The mini-split units are located on opposite sides of an external wall and connected through the wall by what is basically a hole that allows unwanted hot and moist air to pass from the internal to the external unit and out of the building. Ducting for a building-wide AC system can be concealed in drop ceiling spaces, recessed wall cavities and attic space to keep it from looking ugly. However in some buildings it is not always possible to hide the ducting and it ends up being boxed in along the top of walls where there is no other way to embed it behind a wall or ceiling. A lot of people dislike seeing what can be unsightly lengths of box work high on a wall in a room especially in older buildings where asthetics are important. Often, owners will have old house-wide AC systems ripped out and replaced with multiple minisplit units because modern designs take up so little space, have no ducting and look nice while being easily controllable for each individual room. Another huge advantage of mini split, ventless air conditioning units is that each individual room can be acclimatized independently from the others. This means that if only one person is at home, they only need to run one small AC unit in the room they are occupying while the rest of the house is left at its normal temperature. This represents a huge saving in energy costs because it only takes the energy used by one unit to keep the occupant cool and comfortable. This is better than running a larger, whole house system to keep every room cool even though they are unoccupied and all the additional energy it would take to keep it running unnecessarily. While we also sell and install these systems, we understand that it can work out less expensive to buy the hardware online, hence our recommendations above. The choice is ultimately yours to make and since you can save money by purchasing online from a trusted vendor as above, it would be unfair of us not to provide this viable alternative for you. Lastly, we recommend that you be sure of the qualifications of the person you employ to install your AC system as it requires a certain skill level that is often beyond many regular handymen. There are also heat pump versions of this kind of AC system which, if you are interested to know more, are explained in this article: http://energy.gov/energysaver/ductless-mini-split-heat-pumps. Remember, you can call us to obtain a quotation of course and our expert, fully qualified engineers will come fit your AC at a time that suits you.